Summer vacation in Florida — what could be better? Well, you might not be so excited if you were staying with your grandpa in a senior home, without the rest of your family, away from your friends, and miles from Disney World. 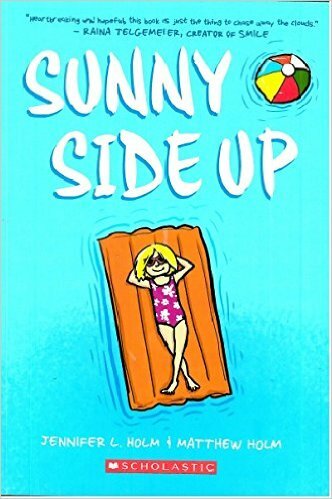 That’s exactly the summer facing the main character in the graphic novel Sunny Side Up by Jennifer L. Holm and Matthew Holm. Still, Sunny Lewin tries to make the best of her summer away from home. And things start looking up when she makes a new friend — someone actually her age, as opposed to all the old folks. Together, Sunny and Buzz retrieve lost golf balls to earn some pocket change and discover they have a talent for finding lost cats. Plus, Buzz introduces Sunny to the joy of comic books! But wait — there’s more to this book than shown here. Yes, Sunny is trying to maintain a positive attitude and she finds plenty of fun things to do. But her summer is also tinged with pain and confusion. There’s something bad going on with her family at home, and even though she’s miles away, Sunny just can’t shake it. I don’t want to give away too much, so I won’t go into detail here. But let’s just say that Sunny, her parents, and especially her older brother are going through a hard time. I didn’t know about this aspect of the story when I first started the book, and I was happily surprised to find that Sunny Side Up is deeper than I expected. But don’t worry, it’s not all doom and gloom. Just like with life, there’s a balance between the sad side and the sunny side. I highly recommend this book to fans of Raina Telgemeier’s books, like Ghosts, Sisters, and Drama. And, of course, if you’re already a fan of Jennifer L. Holm and Matthew Holm from their Babymouse and Squish series, then you’ll definitely want to check out this book. To see a sneak preview of Sunny Side Up, go to the official website, which has a slideshow of the first few pages! Karen was in Florida a few months ago — but not anywhere near Disney World. Like Sunny, Karen was not too pleased about that.